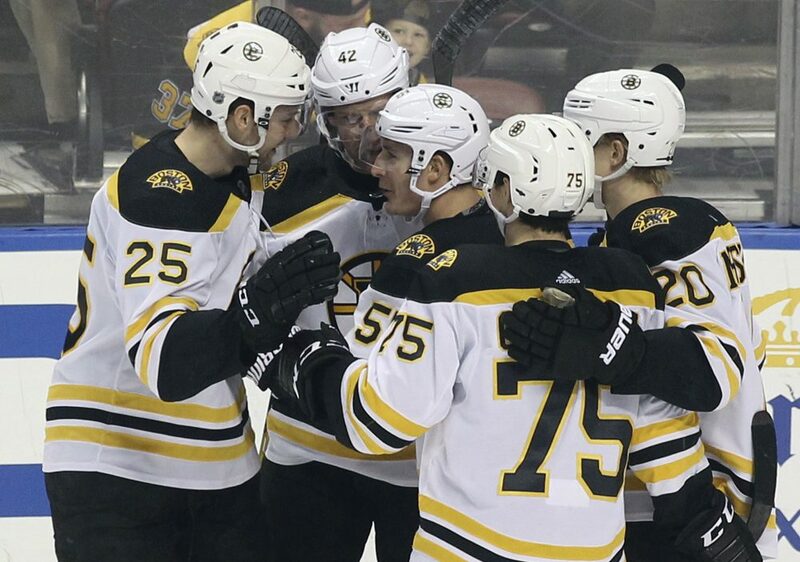 Patrice Bergeron, David Pastrnak, Brad Marchand and Zdeno Chara each had a goal and an assist. SUNRISE, Fla. (AP) — Patrice Bergeron, David Pastrnak, Brad Marchand and Zdeno Chara each had a goal and an assist help the Boston Bruins clinch a playoff berth with a 7-3 win over the Florida Panthers on Saturday night. With Boston leading 2-1, Chara’s shot from the high slot beat Montembeault at 5:05 for his 200th NHL goal. Kuhlman made it 4-1 as he grabbed the puck at the red line, skated in, and fired a shot in at 6:38 for his second career goal. Kampfer and Pastrnak scored 48 seconds apart to stretch the Bruins’ lead to 6-2 with 3:24 to go in the middle period. Bergeron’s empty-netter with 26.8 left capped the scoring. Florida’s Aleksander Barkov landed face down on the ice after a collision with Chara with 3:04 left in the game but left under his own power. Acciari gave the Bruins a 1-0 lead 2:23 in. David Backes passed from behind the net to Acciari, who was alone in front and his shot got past Montembeault. NOTES: Chara is the 22nd defenseman in NHL history to score 200 goals. … Bruins D Connor Clifton recorded his first NHL point on Acciari’s goal. … Marchand has 20 points (eight goals, 12 assists) in his past 13 games. … The Bruins reached 100 points for the second straight season. … Panthers D Keith Yandle played his 900th NHL game.